I’m pretty sure this is old news, but Time Magazine is running excerpts of the book “Hungry Planet: What the World Eats” on its website. 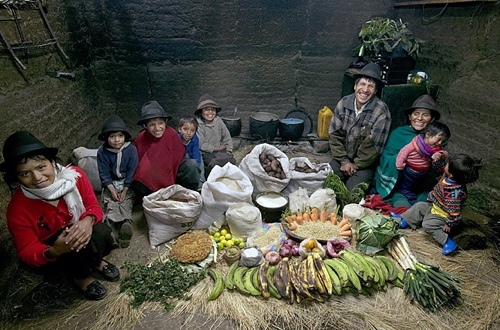 My favourite is the Ayme family from Ecuador, pictured above. It makes me wonder: are pork pie hats mandatory in Ecuador? If so, I’m booking a flight today. This is my pork pie hat. There are many like it, but this one is MINE. My pork pie hat is my best friend. It is my life. I must master it as I must master my life. My pork pie hat without me is useless. Without my pork pie hat, I am useless. One thing that’s concerning me is the lack of processed foods in that picture. Surely they’d have a Subway or a McDonalds or something? Maybe one of those sacks is just full of spice burgers, I dunno. Quick confession: A few days ago, I actually Googled “KFC Rome Italy”. I am weak.